That is what my brain feels like these days. I’m here. I’m there. I’m everywhere. Boy is it draining. We’ve been busy making plans for packing with the remaining 3.5 weeks. I’m happy to say that our niece will be coming into town to help us for a week…so I will happily be able to traipse off to my sewing retreat with the NOLA modern quilt guild for one last fabulous weekend with them. And then I should be able to sign up for some time on the long arm machine in order to quilt like a maniac and get some projects done. Crazy? Me? Never. I’m working away on my bee blocks and finishing up some quilts and writing up some patterns. Yada yada yada. 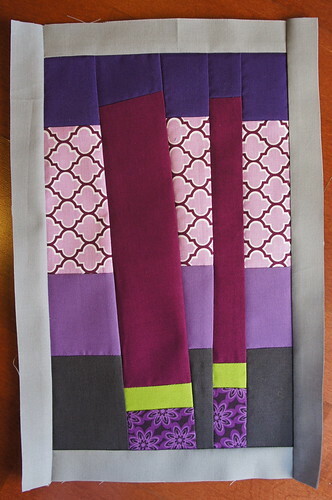 I did finish a block for Jessica who even sent us some of her fabulous new fabric, Timber! (Oh and how did I not know that she is having a book published?!) She wanted a slightly wonky block of any rectangular size no bigger than 14.5″ square with the 1″ grey border around the perimeter. She did say that she preferred not having a huge number of fabrics in one block despite the lovely assortment she sent. So I took her at her word and went with “less is more”. You are busy….I am dizzy just thinking about it all. you are a busy bunny … I am so busy in my head that it's stopping me from being busy in real life … or does that sound mad? don't answer. How do you get so much done?? I love that block with those pops of green! You seriously are a crazy woman, Angela! So only 3 weeks left until you move and you're still wanting to get some quilting in? I love it! Oooh! I love that block! Pack some boxes with the things things you will want right away (i.e. paper towels, cleaning products, tp, stuff for your 16 mos. old, paper plates, cups, plastic cutlery, a set of linens) and put it in your car – even if your car is going on the moving van. Also label every box on the outside and, if you know what room it should be used in in your new house, put that on the box too. Also, before you pack, purge! Good luck with the move.